The design of hospitals and schools require functionality, a pleasant atmosphere and an efficient environment that is hygienic and safe. Highline Blinds in screens have complimented these aims through its simplicity, range of design options and flexibility of sizes. On many large projects we have become increasingly aware and frustrated by the lack of a quality solution for interstitial blinds within the door itself. Highline privacy viewing panels, pre-fitted in the door fulfils this requirement. Supplied by Leaderflush Shapland, the Highline system incorporates horizontal operation slatted blinds as shown above concealed between two panes of glass meaning the blinds require no cleaning or maintenance. Highline panels can be supplied with either steel or timber bead trim and the control mechanism can be on one or both sides, positioned at any height. The thin construction of the horizontal slatted blinds allows visibility to remain high at 90% while open, but offers 100% complete privacy when closed. The blinds are powered by an internal unit with no mains connection or batteries required. 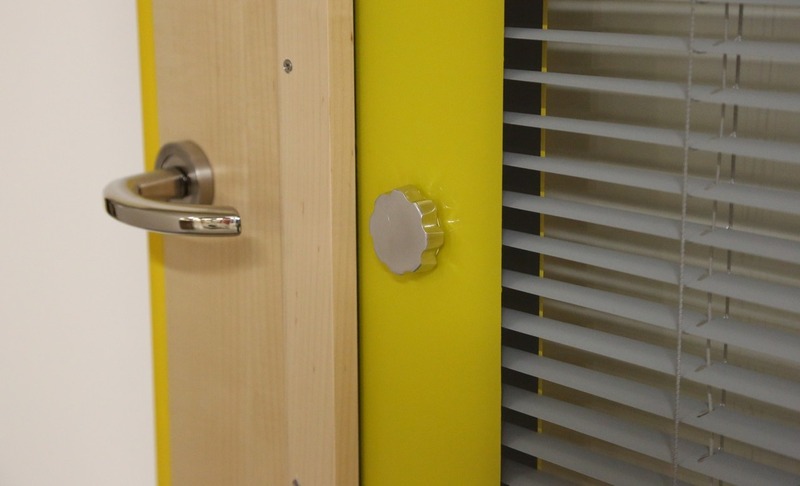 In addition, the control knob has been designed to prevent over tightening of the blinds – a common cause of mechanical failure – giving the product added durability and minimising whole life repairs. Highline is a neat self contained unit within a powder coated metal frame, thus allowing rapid installation into the wall, screen or doorset assembly at a stage to suit the construction programme. 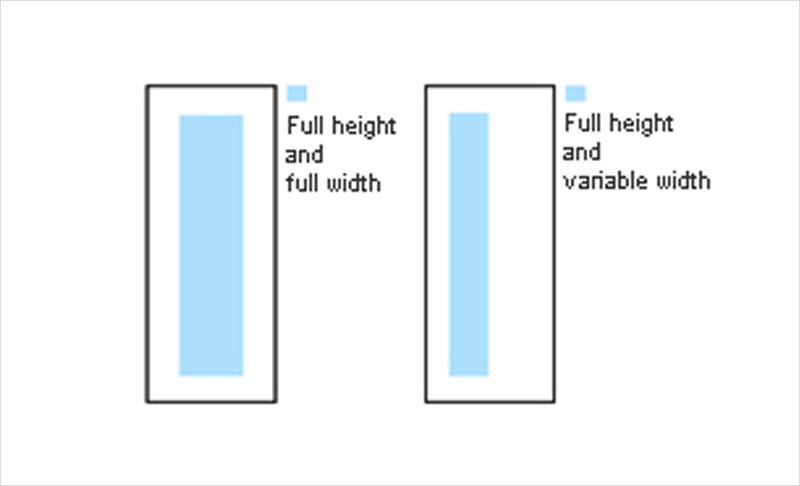 Highline panels are available in 2 typical elevations shown opposite. Highline offers 90% visibility when open and 100% privacy when closed. 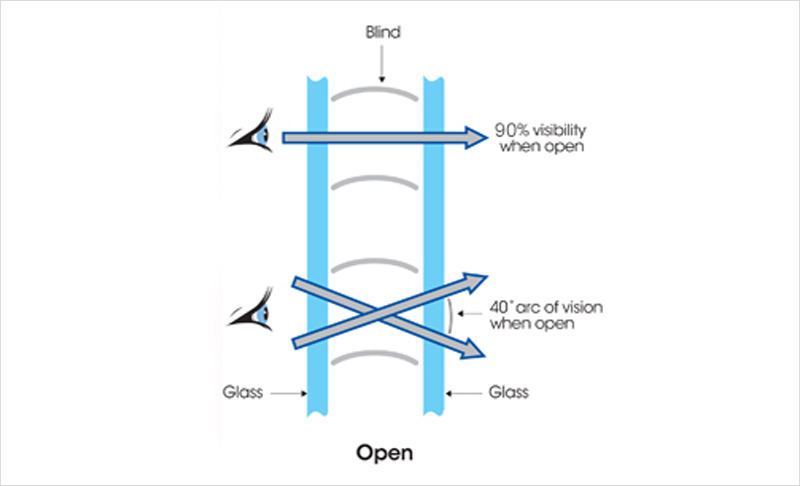 When the blinds are open, Highline allows a 40 degree arc of vision as shown via the diagram opposite. The thin construction of the horizontal slatted blinds allows visibility to remain high while open but offers complete privacy when closed. 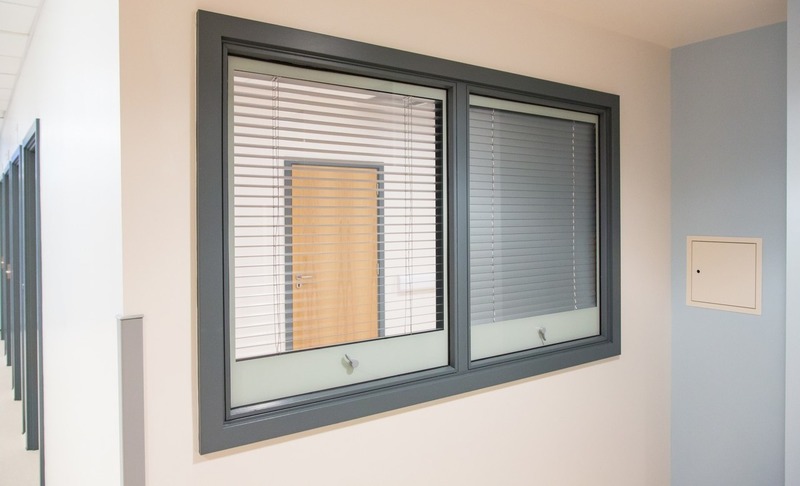 The blinds are concealed between two panes of glass requiring no cleaning or maintenance providing a highly effective and hygienic privacy viewing panel option for healthcare, education and commercial environments.